Roland have been a big player in the percussion pad market for many years. Their pads have generally been ‘multi-pads’ with many different functions. The SPD-ONE offers something new. The various models of the SPD-ONE were brought out to fulfil a small number of functions, but do them very well. As a result, they’re smaller, easier to use, and cheaper than full multi-pads. 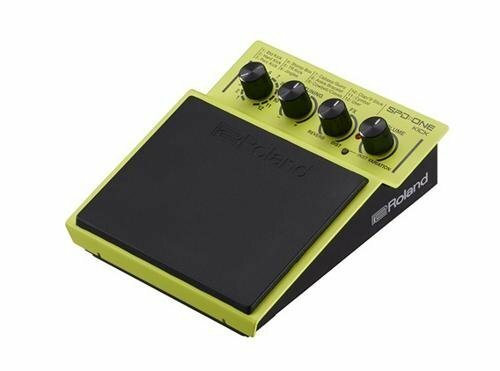 The Roland SPD-ONE is on the market for almost two years and musicians use them quite frequently, particularly drummers, singers and bass players, as well as music producers. 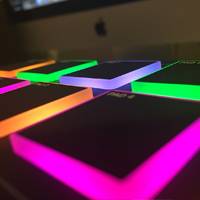 There are four types of these SPD-1 pads, known as Electro, Percussion, Kick and Wav pad. Each one features the same physical shape that provides quick and almost effortless accommodation. Easy access to iconic drum sounds. Great for use as a stomp pad (playing with your foot). Load your own custom samples. If you are familiar with Boss guitar and bass pedals, you will instantly notice that these pads closely resemble legendary units. A massive pad and four analog knobs for easy adjustments are something that looks more like a guitar pedal and that is for a good reason. These pads are designed to be played not just with hands and sticks, but with a foot as well. 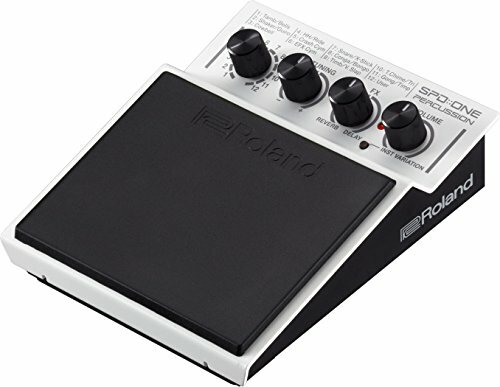 Therefore, Roland has decided for the proven design of its sub-brand, famous for almost military-grade build quality. The pads are made from extremely durable materials and leave the impression they can last for ages. Moreover, the pads stick to the ground extremely well. Each model features the same connectivity features as well, which are rather simple. Of course, there is master output, as well as a phones jack. A good thing about these pads is that you can run them on either adaptor or batteries. Finally, you will notice a USB port from the left side, so you can connect the unit with your computer for MIDI connectivity or for importing samples in the case of the SPD-ONE Wav pad. In the same area you can also notice two small knobs for adjustment of the pad sensitivity. One of four SPD-ONE models is called Electro and its name speaks for itself. This is a perfect unit for all those lovers of vintage drum machines. Inspired by the legendary 808 and 909 drum machine models, it delivers a whole plethora of legendary tones. Thanks to super-convenient knobs, you can easily tweak all these sounds. As I’ve mentioned, this is a simple device, very user-friendly. There are not things like scroll menus, patches, programming etc. – just a couple of physical knobs. In the SPD-ONE Electro, one of the knobs is dedicated to tuning function. The Tuning knob allows you to easily adjust the pitch. Also, there is an FX knob, which allows you to toggle between delay and reverb. Finally, the last knob is the same in all units, reserved for volume control. The SPD-ONE Kick is next in the line. You can count on the same overall design. Actually, the only physical difference between the four units is in color. Other than that, there is a familiar four-knob design and the same connectivity features. In terms of the sound, this model definitely has a lot to offer. Obviously, it is designed to be played with the foot. Therefore, you can count on typical bass drum sounds. The first knob lets you choose different sounds. There are ten types in total. Most of them are various types of acoustic bass drums. There is also one electronic bass drum, as well as Cajon bass. Additionally, the unit offers a few sounds of percussions that are usually played with feet, such as hi-hat chick and ankle jingles. The second knob is the same as in the Electro model. 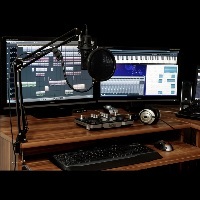 This Tuning knob gives a lot of additional options for getting a variety of different sound characteristics which can completely change the color of the certain sample. Of course, an FX knob is here as well. In this particular model, you can toggle between reverb and distortion. It is a cool feature which, once again, allows you to play with tonal characteristics of each sample. Unfortunately, you can’t use these two effects simultaneously, but only one at the time. That would probably be the biggest drawback of the Kick model. The SPD-ONE Percussion is a perfect choice for every drummer who wants to expand his acoustic drum set. 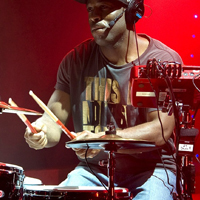 Most drummers feature a rather basic drum set, which is usually missing a couple of essential percussions. Getting all of them can be expensive, so this unit seems like a perfect alternative. It offers a wide plethora of samples. Some of them are typical rhythmic sounds like cowbells or tambourines. Also, there are special sounds like hand claps, timpani, gong, open and closed hi-hats, triangle, wind chimes and much more. Of course, this selection is reserved for the first knob. Rest of the knobs are the same as on the Electro pad. The second one is Tuning knob, which in this particular case allows you adjust a perfect pitch of your pad, in accordance with your set. 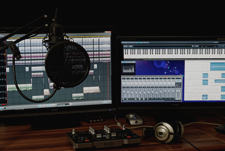 If you want to add a bit of specific flavor to certain sample, there is the third knob. Just like on the SPD-ONE Electro, it lets you toggle between reverb and delay. Once again, these two effects can’t be used simultaneously, but that shouldn’t be taken as a drawback in this case. There aren’t many drummers or other musicians that combine these two effects. Of course, the last knob is for volume controls. In the SPD-ONE lineup, the WAW is definitely the most distinctive unit. Despite the familiar look, it works on a quite different principle. While other three units are common electronic drum pads, this one is rather a playback machine. Instead of percussion samples, it offers 12 empty slots, so you can import your playback tracks, in stereo. This means backing tracks for 12 songs. In theory, you can get much more, because total time goes all away up to 360 minutes. Also, there is no time limit for each slot. 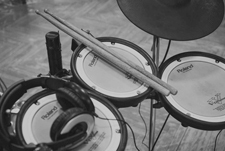 Besides this special feature, this unit can be played as an electronic drum as well. Moreover, that could be done in a pretty versatile way, considering that the pad has a so-called layering function. In practice, that means you can use three different sound samples without turning the knob. Depending on how hard you hit the pad, you get one of three sounds that are imported in a specific slot. This is the only model in the SPD-ONE lineup that accepts multiple import files. The other three accept a single user file only. Also, the importing process is very simple. For any potential issue, Roland has made a nice instruction video, which can be found on its Youtube channel. 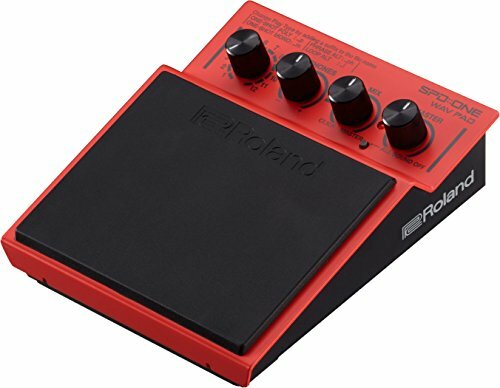 The Roland SPD-ONE models are great electronic drum pads. 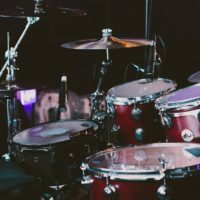 Their strongest point is the simplicity of use, which makes them perfect for anyone who has just entered the world of drum electronic drumming. More experienced players would find it very useful as well because it’s not just easy to use and quick to set up. 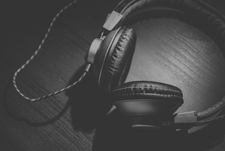 Each unit offers a whole bunch of quality tones. On the other side, the pads are very sensitive and allow lots of dynamics in play. Finally, these pads are built like tanks, which guarantees a long life.